The Time-Locked Expansion servers Deathtoll and Stormhold will come down tomorrow morning in order to merge Deathtoll with it’s PvE-only sister server Stormhold. Both Splitpaw and Deathtoll servers will come down for maintenance beginning at 2:00 AM PT (9:00 AM GMT) for an update to merge servers as mentioned here. Downtime is anticipated to be at least 12 hours to perform this operation. After today, EverQuest II will have no more Player-vs-Player servers other than the Battlegrounds server. 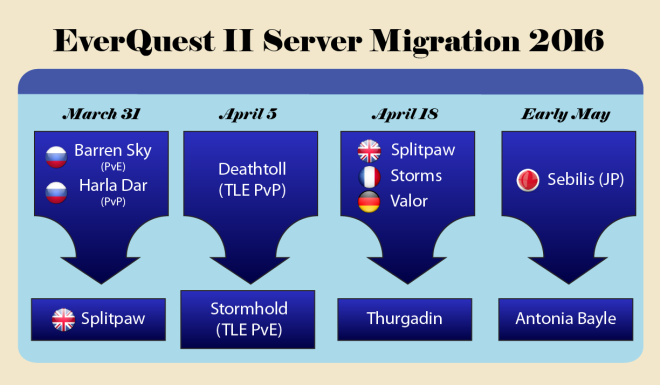 Oh, they’re finally merging the EU servers? That will surely help with population (but kill a huge chunk of remaining storms players imo). It was abysmal on Storms when I left 2 years ago. Down to 7 servers + test, EQ2 doesn’t seem to go very well. Anyway, hugs everybody, I miss you all ! Ah yeah, forgot that one, I stayed with SoE at that time and I thought the launcher was scrapped with the PSS1 deal.